Connectome Computation System (CCS) is designed for Discovery Science of the human brain. We started this project in early 2011 when Dr. Zuo just came back to China from NYU medical center. In 2012, an intial version of CCS was completed and presented in INCF2012. Here is a diagram. CCS extends the functions of FCP scripts onto the cortical surface by integrating FreeSurfer commands and aims to provide a computational platform for multimodal neuroimaging brain connectomics. It contains several unique modules such as quality control procedure (QCP), brain connectome visualization (BCV), test-retest reliability (TRT), multimodal brain parcellation (MBP), and connectome-wide association (CWA). During 2012 ~ 2013, this pipeline has been employed to study the local functional homogeneity (Zuo et al., 2013), the morphological correlates of individual differences in fearful face recognition (Zhao et al., 2013) and Chinese Tai Chi Chuan performance (Wei et al., 2013), the neural correlates of emotion regulation in schizophrenia (Fan et al., 2013), and the default network connectivity in the obsessive-compulsive disorder (Peng et al., 2013). ccs_01_anatpreproc: preprocessing anatomical images including denoising, brain extraction, stage1 of recon-all. We include a further modification on the freesurfer built-in skull stripping process by employing the brain extract tool in FSL to produce two different versions of brainmask: brainmask_tight and brainmask_loose. Notes: there is a document on fixing a bad skull strip. ccs_01_anatsurfrecon: segmenting anatomical images into wm, csf, gm and generate cortical surfaces (stages 2 and 3 of recon-all). After this stage, regional morphological measures are estimated (e.g., thickness, area, sulc depth, volume). Click the right-side icon to see an illustration. Meanwhile, individual surfaces are generated and transformed into a fsaverage stanard space. ccs_01_anatcheck_surf: check the quality of surface reconstruction on anatomical images. This script is commonly employed by the QCP to produce the brain images overlayed with pial (yellow) and white matter (red) surfaces. Notes: there is a set of QAtools from Freesurfer release, which also helps. ccs_01_dtipreproc: preprocessing diffusion images including common steps needed for all DTI-based computation. Two types of tools are used: dtifit commoand in FSL and dti_recon/dti_tracker in DTK. These commands produce voxel-wise metrics of white matter tissues (e.g., FA, MD, etc) as well as individual tracts. ccs_02_anatregister: spatial normalization of individual anatomical images to MNI152 standard template (FNIRT). This procedure sometime is off due to very unique brain shapes or computational convergence. This script can detect if there are some warning messages from fnirt command and re-run the command if the warnings exist. We could update this with ANTS in future. ccs_02_anatcheck_fnirt: check the quality of FNIRT on anatomical images. More details can be found from the page of quality control procedure (QCP). This script produce a set of png images for users to visually inspect the goodness-of-fit between the normalized individual T1-images and the MNI152 template image. ccs_02_dtibbregister: register anatomical dMRI images to intividual anatomical images using boundary-based registration - BBR - (bbregister). This script uses B0 image to achieve the diffusion-to-anatomical co-registration, which will prepare the information for converting freesurfer parcellation into individual parcels. ccs_02_dticheck_bbregister: generate the screenshots for visually check the quality of bbregister on functional images. This script is commonly employed by the QCP to produce the brain images overlayed with surfaces between gray matter and white matter (red). ccs_01_funcpreproc: preprocessing functional images including common steps needed for all RFMRI computation: dropping time points, denoising, slice timing, motion correction, brain extraction, 4D intensity normalization. ccs_02_funcbbregister: generate surface masks and carry out boundary-based co-registration (bbregister). The example of functional brain images extracted from the above step is realigned to the individual's anatomical T1 image regarding the best matching with the GM/WM brain surface. ccs_02_funcregister: register functional images to MNI152 standard template (combining boundary-based co-registration (bbregister and FNIRT). The above BBR-derived co-registration information is combined with the FNIRT spatial normalization into the final transformation from individual functional images to the MNI152 standard space. ccs_02_funccheck_bbregister: produce screenshots of images for users to visually check the quality of bbregister applied to functional images. This is part of the QCP, where you can see more details of the implementation on this function. ccs_02_funccheck_fnirt: produce screenshots of images for users to check the quality of BBR+FNIRT on functional images. This is part of the QCP, where you can see more details of the implementation on this function. ccs_03_funcsegment: segment functional images into wm, csf to prepare masks for extracting nuisance signals of wm/csf. Of note, BBR-derived registration is used for this purpose, which has been demonstrated with more accurate region location for both white matter and csf areas. ccs_04_funcnuisance: remove nuisance signals from head motion, global brain (option), wm, csf (3dDeconvolve). Friston-24 model is used to remove motion (Yan et al., 2013). This script outputs the processed residuals with/without global mean signal regression. ccs_05_funcpreproc_final: remaining functional preprocessing steps with band-pass filtering. Prior to this script, there is another script called ccs_05_funcpreproc_final_nofilt to do same preprocessing without the temporal band-pass filtering. These data is also mapped onto fsaverage5 surface and smoothed for subsequent 2d RFMRI metrics computation. ccs_06_singlesubjectSFC: seed-based resting-state functional connectivity (3dfim+). This approach was firstly proposed as in (Biswal et al., 1995) and has been widely employed to explore the resting state function connectivity across different populations as well as animals. ccs_06_singlesubjectICA: independent component analysis (melodic). Individual-level spatial ICA is implemented as in (Beckmann et al., 2005). The outputs of spatial maps for independent components (ICs) are served as the inputs for our another network-mining algorithm - gRAICAR (Yang et al., 2012). ccs_06_singlesubjectReHo: regional homogeneity (Zang's seminal paper). This script is an very efficient implementation of the original ReHo method by employing the fast algorithms of both spatial and temporal filters. Of note, the steps of spatial smoothing and global signal regression are not used in preprocessing for this computation (see Zuo et al., 2013). ccs_06_singlesubjectALFF: amplitude of low-frequency fluctuations (Zang's seminal paper). The regression of motion, white matter and csf nuisances is employed as preprocessing, which is not commonly implemented in ALFF/fALFF computation. Also, notice that fALFF should be an more ideal metric in theory regarding its normalization nature of power spectra (see Guo et al., 2013). ccs_06_singlesubjectVMHC: voxel-mirrored homotopic connectivity (Zuo et al., 2010). Preprocessing is same as SFC analysis. See some demonstrations of this metric for schizophrenia, multiple sclerosis. This is a direct and easy methods for researchers to examine brain assymmetry in its function. ccs_06_singlesubjectVNCM: voxel-wise network centrality map (Zuo et al., 2012). 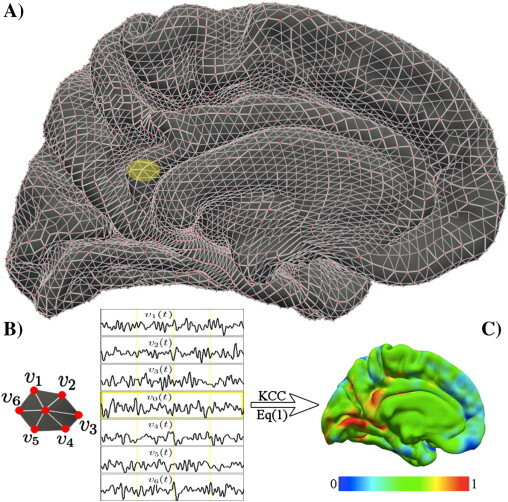 This script produces voxel-wise metrics on centrality at multiple scales of the human brain functional connectomes: degree, subgraph, eigenvector and Google pagerank. See one our recent work on its application in Autism (Di Martino, et al., 2013). ccs_06_singlesubjectRAICAR: Ranking and averaging independent component analysis by reproducibility (Yang et al., 2008, matlab codes, please read README for howto). ccs_06_singlesubject2dReHo: regional homogeneity implemented onto cortical surfaces (2d) (Zuo's paper in 2013). Zuo XN*, Xu T, Jiang L, Yang Z, Cao XY, He Y, Zang YF, Castellanos FX, Milham MP. Toward reliable characterization of functional homogeneity in the human brain: Preprocessing, scan duration,imaging resolution and computational space. Neuroimage. 2013; 65: 374-386. Peng ZW, Xu T, He QH, Shi CZ, Wei Z, Miao GD, Jing J, Lim KO, Zuo XN*, Chan RCK*. Default network connectivity as a vulnerability marker for obsessive-compulsive disorder. Psychol Med. 2013; In Press. Zhao K, Chen YX, Yan WJ, Zuo XN, Fu XL*. Amygdala volume predicts inter-individual differences in fearful face recognition. PLoS ONE. 2013; 8(8):e74096. Wei GX, Xu T, Fan FM, Dong HM, Jiang LL, Li HJ, Yang Z, Luo J*, Zuo XN*. Can Taichi reshape the brain? A brain morphometry study. PLoS ONE. 2013; 8(4): e61038. Fan FM, Tan SP, Yang FD, Tan YL, Zhao YL, Chen N, Li BB, Song CS, Wang YH, Jin Z, Zhou DF, Milham MP, Zou YZ, Zuo XN. Ventral medial prefrontal functional connectivity and emotion regulation in chronic schizophrenia: A pilot study. Neurosci Bull. 2013; 29(1):59-74.